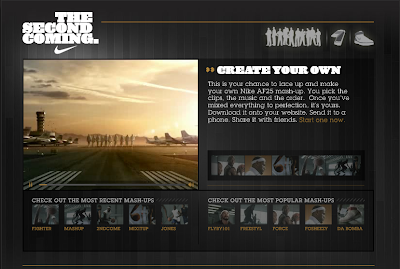 The male Tadpoles and their friends have been having a world of fun with the new Nike basketball site. The Mash-Up feature, in particular, which lets you take one of about 75 different clips from the :60 spot and 3 variations of the music and click-n-drag them together to make your own commercial which you can then post on the site. And watch over and over again. Well done, fun and easy to use and definitely helps to promote the brand and the tie-in to basketball. Lots of them posted to YouTube already, so clearly the kids who did them are proud of them. Is this "consumer generated content"? I don't think so. What about you? I say that because even with all the Doritos-type contests out there, agencies and brands still control much of what a consumer can submit in these things: logo usage, size, no copyrighted material, etc. Things that any agency would not be limited by for any creative presentation they typically make. Not sure if I'd even call the Mentos/Diet Coke stuff "advertising" or "content" - it's a side show act of people blowing things up that just happens to involve Diet Coke, but unless you were going to perform the same trick, you wouldn't go out and buy Diet Coke because you'd seen one of these.